The holidays are a time for family, friends and lots of food. Yes, gifts are great but we all know getting together and enjoying the food is the best part! We were thrilled when the sweet folks at Nettie's Country Bakery reached out to us about our holiday gift guide and wanted to be involved. Do you see what they were offering? Who would ever say....No? What we loved the most about these is they have that good homemade flavor and are made with love. These are just a few of delectable delights currently offered by Nettie's Country Bakery. Any of these would make the perfect gift this holiday season. 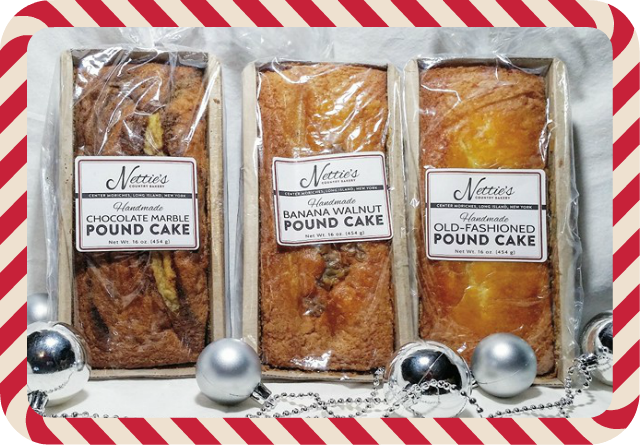 Three Cake Sampler - $39.99 A sampling of three classic pound cakes: Old-Fashioned, Chocolate Marble, and Banana Walnut. Chocolate Marble rich chocolate swirls add a touch of decadence to this buttery pound cake. Perfect for the chocolate and vanilla lover alike. This classic pound cake is moist and buttery, with a golden brown crust. Enjoy it plain or lightly toasted with whipped cream and fresh berries! Banana Walnut cake features fresh banana's and hand chopped walnuts, giving it the perfect blend of sweet and savory. **this comes in different prices depending on product count ordered. Nettie's Country Bakery is family-owned bakery located on Long Island, NY and they specialize in handmade, old-fashioned baked goods. They bake everything from scratch using real ingredients and recipes that have been passed down over time. Their online product line includes crumb cakes, coffee cakes, brownies, cookies and loaf breads. Click here to find out more. May all of your holidays be filled with family, friends, and love from the sweet folks at Nettie's Country Bakery. As always, keep it southern my friends! A disclaimer and disclosure: * We received one or more of this product in exchange for a review. We were compensated with product for our reviews, however, all our opinions are our own, based on our personal experience with the product. In the event of a giveaway, the sponsor is responsible for delivery of the prize, unless otherwise noted in the posting. We are disclosing this in accordance with the Federal Trade Commission’s 16 CFR, Part 255: Guides Concerning the Use of Endorsements and Testimonials in Advertising. That pound cake looks delicious I'd try it! I would love to try the Old Fashioned Pound cake. I don't even know where to start! I love old-fashioned pound cake & my nephews would go for Rudy's Brownies! I've always loved tea cookies. 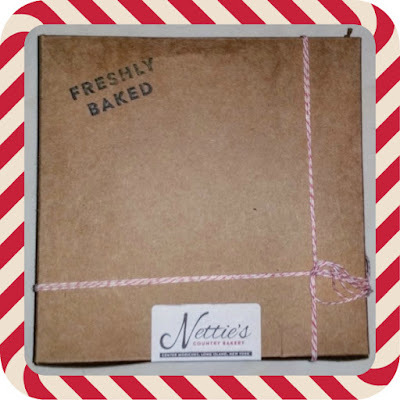 I'd love to try Nettie's Bakery's version! 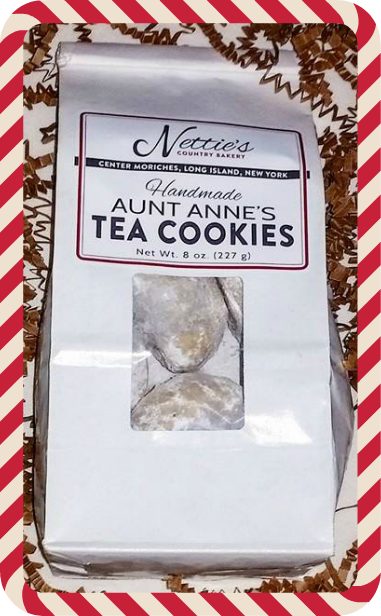 I would love to try Aunt Anne's Tea Cookies! the crumb cakes or the coffee cakes both look really good. I bet they'd be good warmed a little. I would love to try the banana walnut pound cake. All of their baked goods look delicious but their apple pies, which I saw on Instagram, look amazing. I'd love to try that. Banana Walnut cake is calling my name! I'd also like to try the oatmeal raisin cookies. I've always loved oatmeal cookies. The tea cookies sound really good and I would love to have a couple with a cup of coffee. I love pound cake, so their pound cake sampler looks great to me! I would like to try the Banana Walnut Pound Cake. I would love to try any of the pound cakes but the marbles chocolate one really looks good. I'd love a slice of that old-fashioned pound cake with some ice cream! the chocolate marble pound cake would be great. I love most pound cakes. Their bread looks crazy good! I would love to try the old fashioned crumb cake. That old-fashioned pound cake looks great to me. I love pound cake. I'm a fan of pound cake, so any of them would be great. The chocolate marble pound cake looks good. Their brownies look so good! I want to try the Chocolate Marble Pound Cake. Those tea cookies look really good! Maybe Santa would like those, too, lol. I'd like to try the pound cake. I like putting flavored spreads on pound cake. Aunt Anne's Tea Cookies sound really yummy! I would like to try the Old Fashioned Pound Cake. I'd love to try those coffee cakes or the crumb cakes. Either look good.